Delaware covers 2,489 square miles and has a population of 783,600 people. Delaware’s capital is Dover, which has a population of 2,012. Other important cities are Wilmington (pop. 72,664), Pike Creek (pop. 19,751), Bear (pop. 17,593),Newark (pop. 28,547) and Brookside (pop. 14,806). 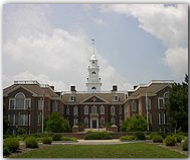 Delaware was admitted to the Union on December 7th, 1787 as the 1st state. The state flower is the “Peach Blossom” and its’ nicknames include “The First State”, “The Diamond State”, “The Blue Hen State” and “The Small Wonder State”. Delaware’s economy is broken into two categories; agriculture and industry. Poultry, nursery stock, soybeans, dairy products and corn provide for the agricultural side. While chemical products, food processing, paper products, rubber and plastic products, scientific instruments, and printing and publishing provide for the industrial side.